“En”couragement instead of “Un”couragement. “In”spiration, not “Un”spiration. “Taunt-” refers to ‘stuff’ collected by me, Greg Taunt. “-ism” refers to taking action or putting something into practice. So, a “Tauntism” is quote, saying, story, etc. – something, that I hope will inspire you (and me) to take action, change a habit or begin a new practice. Inspiration begins with an idea – As you think, so you live. It’s easy for us to “drift” or allow our lives to go “off course.” Often, we feel like our life doesn’t have any meaning or we fall into a rut. Step back and take a look at some Tauntisms. Recharge your batteries and recognize that life is much more than just existing. My hope is that Tauntisms.com will help all of us refocus, recharge, and remember there is a purpose for our lives, even if we question it or don’t realize it at the moment. The Book of Taunt – Clever quotes, sayings, and anecdotes that make a powerful point. Thought Provokers – Motivational and meaningful stories, fables and collections. Scripture Energizers – Practical Bible verses that guide and direct our daily living. The Ticket to Heaven – A simple, powerful paper folding exercise illustrating God’s love. Web Connections – Various, useful, fun, and interesting websites. RSS Newsfeed and Email List – Tauntisms delivered your way. View a random Tauntism from the entire collection. 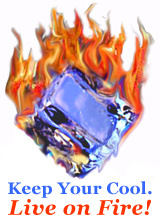 Special Thanks to: Mr. Alva Hazell for creating our “Ice on Fire” logo for IntenseLiving.com.